UPDATED: Sun., Jan. 21, 2018, 3 p.m.
NEAR THE SYRIAN BORDER – Vice President Mike Pence, weighing in from the Middle East on the shutdown in Washington, accused the U.S. Congress of playing politics with military pay, and told American soldiers stationed near the Syrian border that the Trump administration would demand that lawmakers reopen the government. The vice president spoke as Democrats and Republicans in Congress showed little indication of progress on negotiations to end the government shutdown in a feud over immigration and spending. While Pence did not speak about party affiliation, Republicans argue that Democrats are blocking additional money for the Pentagon by keeping the government closed. During a government shutdown, all military members are required to report for work as usual. Troops cannot be paid for duty performed after the shutdown began Saturday, but their paychecks will be delayed only if the government closure lasts beyond Feb. 1. That’s because pay is issued only twice a month, on the first and the 15th. Democrats said they offered a measure on the Senate floor to allow service members to be paid during the shutdown. On Sunday, White House budget director Mick Mulvaney also complained about the shutdown’s potential impact on the military, but acknowledged that troops were all but certain to get their pay. Landing aboard a C-17 military aircraft, Pence visited an undisclosed military base in the Middle East following his meetings in Amman with Jordan’s King Abdullah II. Journalists covering the vice president were asked to withhold the name and location of the base, and the number of troops stationed here, because of security and diplomatic concerns. The 332nd Air Expeditionary Wing is stationed at the base and has dropped nearly half of the munitions during the operation to destroy the Islamic State group in Iraq and Syria. 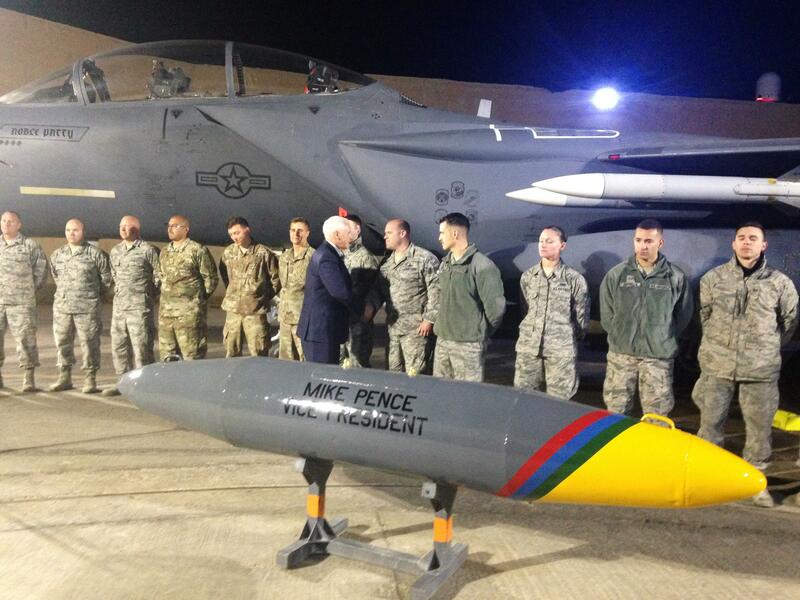 Pence credited the troops’ “heroic actions” to dismantle terrorist organizations in the region. “We will not rest, we will not relent, until we hunt down and destroy ISIS at its source,” he said. Published: Jan. 21, 2018, 8:51 a.m. Updated: Jan. 21, 2018, 3 p.m.